It's three o'clock and you're getting that angry sugar craving, you can picture those ooey gooey chocolate chip cookies in the break room. Or maybe you're at home, you've just opened a tray of cookies, telling yourself you're only going to have a couple, and when you next look up you've eaten two out of three rows of those delicious chocolate and vanilla babies. Though your mouth might be dry and your stomach is swollen, you could definitely eat that third row. That's the magic of the cookie monster, everyone can relate to him because everyone, at one point or another, has become him. When you're dressing up as the Cookie Monster you have a convenient excuse to clean the snack table of any sweets at any Halloween party. 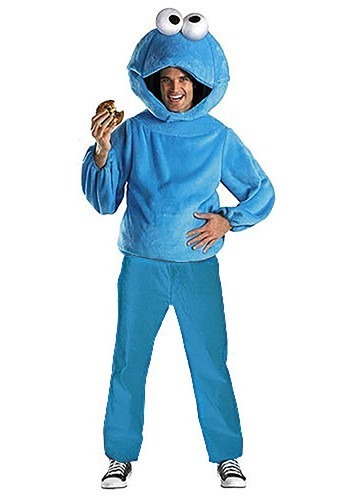 If you show up to a Halloween party wearing this costume for the second year in a row don't be surprised to see party hosts running away with the sweet trays and a look of pure panic in their eyes. Don't feel bad, though, you're just in character. If this should become a regular occurrence, feel free to bring you own bag of cookies to the party. When you break them out, be sure to eat them messily, getting crumbs all over the floor. That's not only part of Cookie Monster's shtick but also a great way to punish the party host for hiding cookies from you. There's no better costume for those with an overactive sugar tooth. Don't worry about looking greedy as you take one more gingersnap from the buffet, people expect enthusiasm from you now. Let out your inner monster, no cookie is safe.